Well, I survived my first day! It was in part not as bad as I expected and other parts worse than I imagined. Overall, not a bad first day; here is the scoop! My first class was not until 1:00pm so I had the morning to kill. My day was off to a great start when I sliced my foot open walking out the door to get the mail. 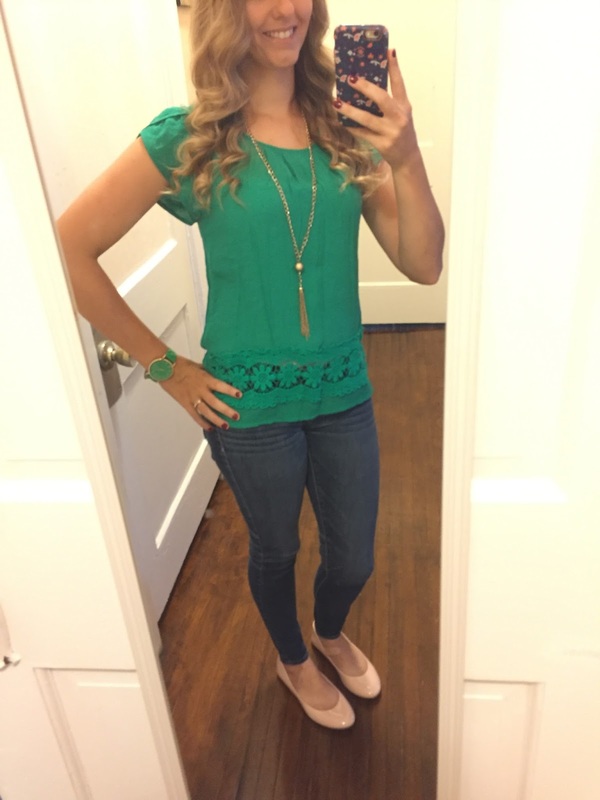 My outfit was classy yet casual with nice jeans, flats and a nice top. I wanted to look nice without looking overdressed. I saw everything from sweatpants to full suits when I arrived at the school. I think I will stick with a classy casual style. I went on campus early to get my name officially changed to my married name and then headed over to the law school to kill time before my first class. I was surprised by the number of people I did not recognize right away. I reviewed Property until 12:45 and after finding two of my friends from orientation, we found good seats in the classroom. I wanted to be extra early in case it filled up fast and all good seats were taken. Thankfully we got 4 seats in the middle of the 4th row and our 4th friend arrived soon. The entire 1L class is in the contracts class (74 students) so I am glad we got the seats we did. My first class was Contracts and our professor showed up about 5 minutes before 1:00 and promptly loaded an AC/DC song up on the projector and started playing it. Needless to say, it broke the tension and started class off with a laugh. He proceeded through 4 rock "n" roll songs to let us know what law school was like. "Hit Me with your Best Shot" by Pat Benatar is supposed to be us during exams, "Mixed Emotions" by The Rolling Stones is everyone on day one and "Run Like Hell" by Pink Floyd is what we will all be doing from now until June. Our Contracts professor gave us a thorough overview of the syllabus, class expectations, what to expect and how to be successful. We didn't even make it to the material today which was fine with me! It was a pretty chill first class. Next up was Property. I had my mock class in orientation with this professor so I slightly knew what to expect. Once again we got decent seats but this class was much smaller than Contracts. 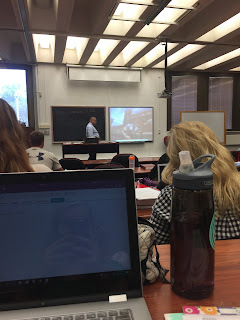 This professor did a quick overview of the syllabus and class expectations before diving into the material and our first cases. I struggled a bit in this class keeping up with him, he was moving super fast, and with understanding some of his verbiage, he talks very quietly. After a bit, I started to catch on and get in the rhythm. I even raised my hand to state the rule of our first case but then fumbled and went blank and had to say I wrote down the wrong thing. It was slightly embarrassing but it could have been worse. I am proud of myself for raising my hand and trying. So far, property seems very interesting which surprises me. I thought it would bore me to death. After Property, I am done for the day so I rushed home to eat because I was starving (future notice, I am taking a snack for between classes). Now I am finishing up Core Grammar, reading for tomorrow and typing up all of my briefs and organizing my notes. I am using Microsoft OneNote for my note taking and briefing. More on that system in a later post. 1. Study groups have already formed and were meeting today which seems crazy soon. The friends I made at orientation and I are talking about doing the same but we haven't set anything up for sure yet. 2. I am very happy I made the connections I did because it made the first day less stressful to know people and have friends to sit with. 3. My professors thus far are so nice and seem to be willing to go above and beyond to help us be as successful as possible. I am more and more reassured that I made the best decision in choosing my law school. 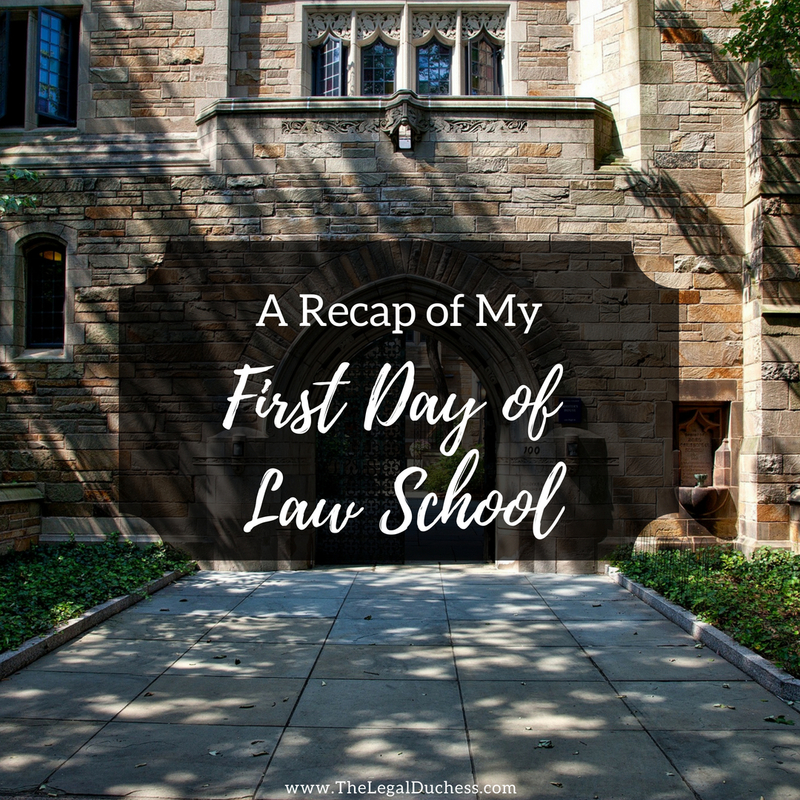 Overall, it has been a pretty decent first day of law school. I hope everyone else had a smooth and painless first day!